We offer several different secretory tags for use in yeast cells, in easy-to-clone formats. The rationale for selling several different tags is because experience shows that no single tag is ideal for all proteins, and some proteins work better with different secretory tags. Each of these secretory peptides is provided in a vector allowing simple N-terminal fusion with your gene of interest. Most of the constructs also include the auxotrophic Uracil selection expression cassette URA3 gene, allowing positive selection of transfected yeast cells by growing the population in the absence of uracil. 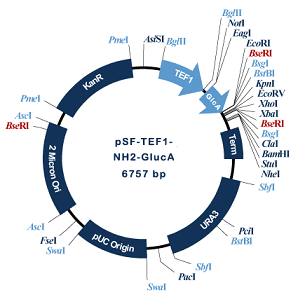 The plasmid structure shown contains the Glucoamylase secretory tag positioned upstream of the MCS, for inclusion at the N terminal of your gene of interest. Alpha amylase signal peptide and the full length alpha factor; we sell an extensive range of plasmids containing these signal peptides together with a range of additional functional peptide tags and protease-cleavage sites. In each case the secretory signal peptide will be naturally removed during secretion and the protease cleavage site allows removal of the additional functional tag from the protein if/when required after production. - Factor Xa – cleavage specificity IEGR?